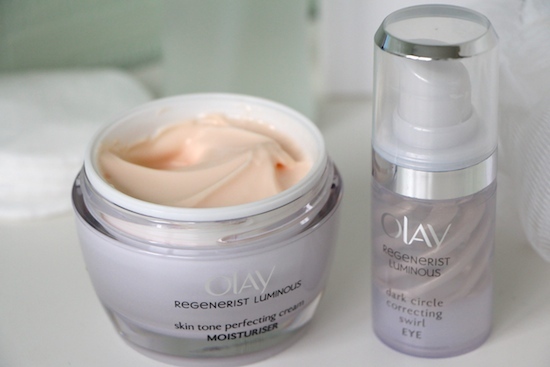 Focus of the month, or at least the first half of the month, has been Olay’s Regenerist Luminous range, because I have been finishing off my pre-launch testing for them. If you’re a regular reader you’ll know that I’ve been working with Olay over a four week period to trial the Regenerist Luminous products and record my findings; the four weeks are now over. Actually, the four weeks were over last week, but I’ve carried on using the moisturiser and eye cream twice a day which is, I suppose, a testament to how much I actually like them! Don’t get me wrong; as soon as I’d shot the “after” photograph for the “before and after” comparison, I was straight into my bag of tricks, delving about for new masks to try and lotions to faff about with, but I voluntarily kept up the twice-daily application of the Regenerist Luminous and am going to continue until they run out. Because despite my initial dislike of the range’s texture (please read here for full review post, but basically I didn’t like the “dry touch” feel of the products, preferring a dewy sheen to the more “velvet” finish that silicones seem to produce) I actually got on with the products very well indeed. No dryness, despite the dry “feel” of the cream, absolutely not one single spot, even with PMT in full-swing, and my skin definitely had a bit of a glow going on. The idea of the range is to help even out the skin tone and increase luminosity; I didn’t have any particular areas of pigmentation, so I can’t vouch for that, but an increase in luminosity? Yes. I think I may have to agree on that one. 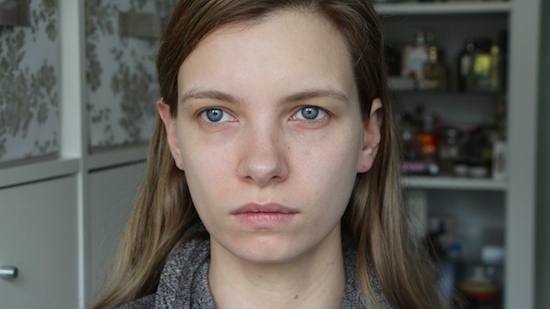 A note, if I may, on the following “before and after” pictures: I tried to take them at the same time of day, with the same natural lighting, face each time completely bare of makeup and of skincare. Just naked face. It’s incredibly hard to do these before-and-afters, I have discovered. 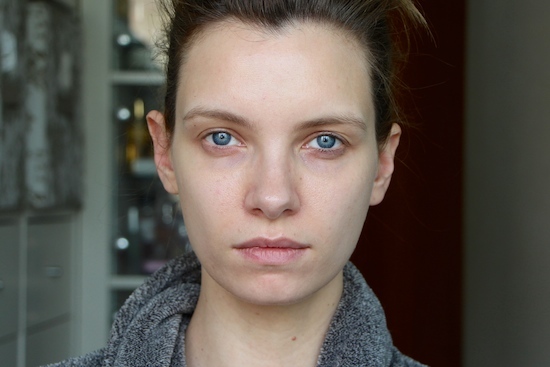 Easy with makeup looks, because you’re sat in exactly the same spot with exactly the same lighting, and only about half an hour has passed between the two shots, but skincare? Over a four week period? I have done my best, that’s all I can say! Ah. It’s like trying to spot differences between penguins, isn’t it? It doesn’t help that I have the same gormless stare in each photo! 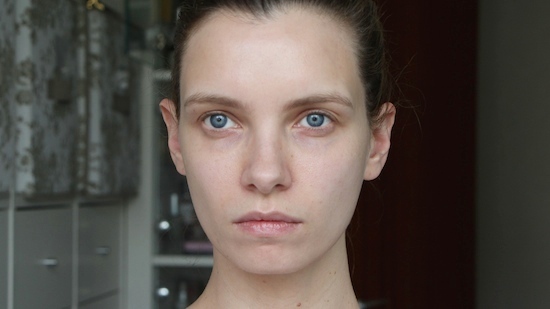 But I think that the photographs do show up the increase in glowiness and also, if you look carefully, a decrease in little blotchy patches here and there. What do you think? I’ll be interested to know your feedback once the range launches; but for fifty of you there’s an opportunity to try the moisturiser for free. [The first fifty UK/ROI readers to email Olay with their name and address will receive a full-size Regenerist Luminous moisturiser – the email address is [email protected]. I’m afraid I have no control over this little giveaway so I won’t know when the samples have run out, but I’ll endeavour to keep on top of it and update this post if I can!] **UPDATE: samples are now gone. ** Terms and conditions are at the bottom of the page. You’ll notice that the rest of the video is somewhat haircare heavy; I have discovered the best little budget range this month. L’Oreal’s Elvive Fibrology. I say “discovered”; I should have said “read millions of rave reviews and decided to dig it out of the slush pile”. This hair thickening range from Elvive is absolutely wonderful! It really worked from the very first wash! Top banana. My hair, dried naturally, looks as though I’ve spritzed in some kind of volumising mist; blow-dried it is thick and fulsome and mane-like. Well worth a try, I’d say. Take a look at the video to see what else I’ve been favouritising this month – there are a few old favourites that I’ve been meaning to feature for ages and a couple of new bits that have caught my eye. A nice mix. 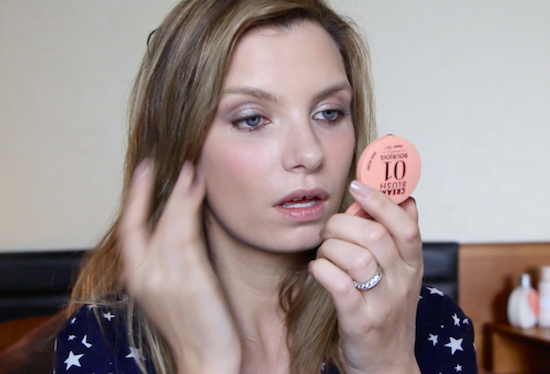 And for those who enjoyed my last “Beauty Review” video, I’m just about to start filming the next one so if you have any more suggestions, please pop them in the comments below! 1. This offer is open to all residents in the UK and ROI aged 18 years of age and over. Offer closes at midnight on 31 March 2014 , or while stocks last. 2. Only one entry per person. No bulk or third party entries accepted. 3. To enter send email with your name and address to [email protected]. 4. There are 50 x Olay Regenerist Luminous Skin Tone Perfecting Cream samples available to the first 50 entrants. 5. The samples are as stated and cannot be transferred, sold or exchanged. There is no cash alternative. Only one sample per person. 6. Prize winners will be notified by e-mail within 7 days of the closing date. 7. Please allow 28 days for delivery after notification. 8. The Promoter reserves the right to substitute the sample for a product of equal or greater value in the event of unavailability due to circumstances beyond the Promoter’s control.